Peter Friedman's freshman year is not shaping up the way he had hoped. He always dreamed that he and his best friend, AJ, would be the young heroes of the high school baseball team, beloved by girls and worshipped by everyone else. Unfortunately, he ruins his pitching arm before the year even begins, and his grandfather is suddenly acting strange, giving Peter his expensive camera equipment and spacing out. Suddenly, Peter has to redefine himself, and he is fortunate to have Angelika, a cool girl from his photography class, to help him do it. No one writes teenage boys like Jordan Sonnenblick. He is able to hook the most reluctant readers and prolific enough that by the time they've finished all his books, there is nothing reluctant about them. 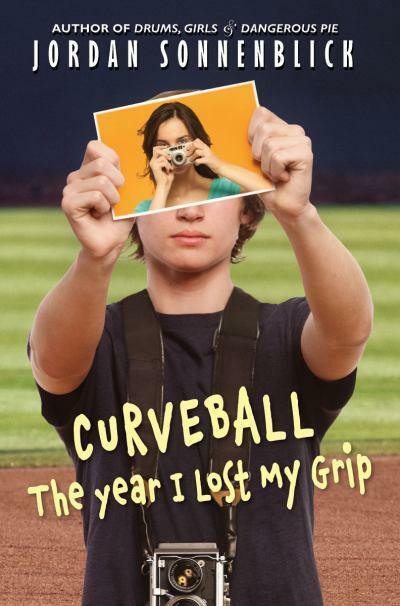 While baseball is the impetus for much of the drama, Curveball: The Year I Lost My Grip should not be considered a sports book. It is so much more than that, and one that will appeal to male and female readers. Grampa's decline into Alzheimer's is heartbreaking. Peter can't bear to lose his hero, so he keeps Grampa's secret, long after he knows that he shouldn't. Sadly, this seems to be Peter's defining quality, which makes him less endearing than Sonnenblick's previous protagonists. Still, denying a problem until it becomes worse is age-appropriate and will be relatable for readers. 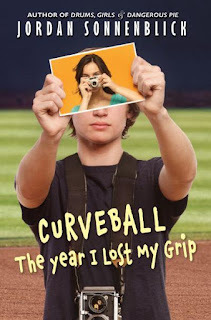 Despite the heavy topics, Curveball is humorous, particularly when Peter adjusts to high school life. Although he hides the extent of his injury from AJ for too long, their friendship is fun and it will be easy for readers to project themselves onto their friendship, as well as Peter's relationship with Angelika. At times I wished that Peter could be more distinctive, but I see that having keeping him as a broad character will make him more appealing to a wider audience. Sonnenblick is so, so good! I thought this line was just perfect: "He is able to hook the most reluctant readers and prolific enough that by the time they've finished all his books, there is nothing reluctant about them." I haven't heard of Curveball. Thanks for the introduction!